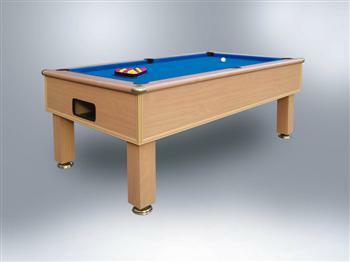 This superb range of slimline pool tables now available for the more discerning pool players. They are built in the UK using only the finest 3/4in Italian slate beds covered with Milliken West of England 27oz cloth or Simonis 760 Speed Cloth. The tables are attractively finished in a durable veneer in a range of styles and colours to enhance any poolroom. Complete with accessories (2 cues, Aramith balls, brush, triangle, PVC cover, rules and 12pc chalk.